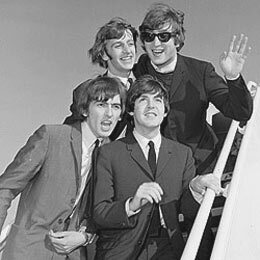 ABOUT THIS PRESS CONFERENCE: Following an afternoon press conference during brief stop in Los Angeles on August 18th, the Beatles traveled on to San Francisco. This marked the beginning of their breath-taking 1964 North American Tour, covering 24 cities and giving 32 shows in 34 days. The Fabs gave the following press conference on the evening of the 18th at the San Francisco Hilton, and then rocked the house at Cow Palace in San Francisco on the following night. The group performed just one show at Cow Palace, playing to a sell-out crowd of over 17,000 fans. The next day, the Beatles' tour would move onward to Las Vegas Nevada, the second stop on their breath-taking sweep of North America. Q: "How was your trip?" JOHN: "It was sort of like a plane trip, you know... Boring." RINGO: "We've been going seventeen hours now, you know." Q: "How often do you get haircuts?" JOHN: "Uhh, about once every three weeks." PAUL: "Yeah. Actually, it's cut." Q: "This is your second trip to San Francisco, are you going to see more of it this time than you did last?" 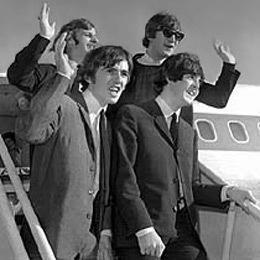 RINGO: "Well, I only saw the airport last time, so I've seen more already." JOHN: "Can you direct your questions so that everybody can hear them, please?" PAUL: "Just a minute... Here's Derek. I'd like to introduce you..."
GEORGE: "A big hand for Mr. Taylor." JOHN: "This is our press representative." Q: "Who is your tailor?" PAUL: "A fella called Millings of London." PAUL: "A little back street in London." JOHN: "Old Compton Road. He keeps moving with all the profit he makes... Hmmmm hmmmm, he said." Q: Are you working on another movie soon?" Q: "Is it coming out then?" RINGO: "No, we start making it." JOHN: "We start making it then." Q: "How frightened were you getting in that cage today?" JOHN: Uh, it wasn't bad, 'cuz somebody had been up there and tested it." RINGO: "In fact, all the press went up and tested it." Q: "Why did you leave so soon?" RINGO: "We got told, you know." JOHN: "Some people said, 'Climb up on the thing,' and then we wave, and then they said, 'Get off,' You know. And we come down and wave." PAUL: "And so we got off, you know. We're very obedient." JOHN: "Oh we are! Arf arf!" Q: "Do you think San Franciscans are any worse than any other place in the world?" PAUL: (sings) "'San Francisco.' Good town." Q: "The people... the crowd that you had... Were they any worse?" PAUL: "Marvelous. Very good crowds." JOHN: How do you mean, 'worse'? What's he mean, 'worse'?" Q: "Why did you start the tour in San Francisco?" RINGO: "Well, you'd better ask someone else. I don't know." JOHN: We don't plan the tours. They're planned for us, you see. We just say we don't want to go to, sort of, Buh-boo-boo land... and we leave the rest of the world open. It's all planned for us with a hearty, healthy Hey! Jolly good." Q: "How do you like not having any privacy?" PAUL: "We do have some, you know." JOHN: "We just had some before. Didn't we, Paul?" PAUL: "We don't have alot." Q: (to John) "Your hair looks like it's red. Is it red or is it wind-blown?" JOHN: "Red? Oh no. Well, I've had a shower, you see. It sometimes goes a bit funny. You know, one can never tell... One gets underwater." Q: "Ringo? You didn't look too happy when you got off the airplane." RINGO: "If you'd been on it fifteen hours, how would you look?" JOHN: "How would he look, Ringo?" RINGO: "Look at him now!" Q: "Which one of you is married?" RINGO: "John's married. We'll all get married in the end." RINGO: "In the end. Two or three years, you know. Plenty of time." JOHN: "Do you mean you're not 'funny' like the rumor says?" PAUL: "Lots of rumors in America." Q: (to John) "Are you writing now?" JOHN: "Yes. I wrote all the way over on the plane." Q: "'Partly Dave' and that sort of thing?" JOHN: "No. I've already written that one, thank you. I wrote 'Snore Wife and the Seven Dwarts.'" Q: "What is the name of the next movie?" RINGO: "We don't know yet?" RINGO: "We don't know. We don't start it until February." Q: "Now that you've made a movie, do you dig the acting bit?" JOHN: "We don't profess to be actors." PAUL: "Besides... it's only Americans that 'dig.'" PAUL: "Dig your baby, daddy!" JOHN: "Oh, I get it." Q: "In America, the current slang is: 'tough,' 'boss,' and 'dig.' What are some of England's?" JOHN: "They're ever-changing, you know, Madam. 'Alec Douglas-Hume,' That's a big one. 'Wilson,' Everyone does it." PAUL: "There's alot of slang. 'Barry Goldwater.'" JOHN: "That's a new one over there. It means, 'Drag.'" Q: "What does it mean over there?" JOHN: No, it means... uh... 'Happy days are here again.'" Q: "Are you going to be back in time for the elections?" Q: "No. Back in England." JOHN: "Are they having them again?" GEORGE: "They have 'em every week." Q: "Ringo, how do you feel about the 'Ringo for President' campaign?" RINGO: "Well, it's rather... It's marvelous!" Q: "Assuming you were President of the United States, would you make any political promises?" RINGO: "I don't know, you know. I'm not sort of politically minded." RINGO: "No, John. Believe me." PAUL: "I think you should be President." JOHN: "I saw you dancing with Bessie Braddock." Q: "How do the other guys feel about Ringo being nominated for President?" JOHN: "We think he should win, you know." PAUL: "Yes, we think he should." Q: "Ringo, would you nominate the others as part of your cabinet?" RINGO: "Well, I'd have to... wouldn't I?" GEORGE: "I could be the door." RINGO: "I'd have George as treasurer." JOHN: "I could be the cupboard." RINGO: "He looks after the money." Q: "Are you going to be visiting Miami again this year?" RINGO: "Not unless it's on the tour." GEORGE: "We're going to Florida to do a show in Jacksonville... the Gator Bowl. But we won't be going to Miami." Q: "Is Liverpool going to win the first division this year?" RINGO: "I don't know, I don't follow football, you know." Q: "You don't follow football?" RINGO: "No. I don't follow football! You got the message. I don't know, are they winning or something?" JOHN: "We don't like any sport. Waste of time." JOHN: "No, we can all swim." Q: "John, when do you write your next book?" JOHN: "Uhh, well... All the time, you know." Q: "Do you keep little notes?" JOHN: "Yes... here and there." Q: "Ringo, can we see your rings?" PAUL: "Show 'em. Go on." Q: "Ringo, can you look this way and hold your rings up?" JOHN: (jokingly) "Could you do it again, Ringo?" PAUL: "Ringo, just one more for the east coast! One more for the east coast!" JOHN: "I've got it! I've got it!" RINGO: "Have you got it?" JOHN: "Oh, me flash is gone." PAUL: "One for 'Life' magazine." JOHN: "Ha ha ha, eh Ringo?" RINGO: "'Life'? That's a big magazine." Q: "Ringo, you're on the cover." Q: "What do you boys plan to do in San Francisco other than sleep?" RINGO: "Just play the 'Cow Palace,' that's about it." Q: "You're not going to see the town?" RINGO: "No, we're not going to see your beautiful city that we've heard so much about." GEORGE: "It'd take too much organization, wouldn't it?" RINGO: Oh, you wouldn't see anyway, just speeding along in a car." JOHN: "Help, Derek! They're getting out of hand!"